We check our email and phone messages daily from Monday – Friday so please leave us a message. 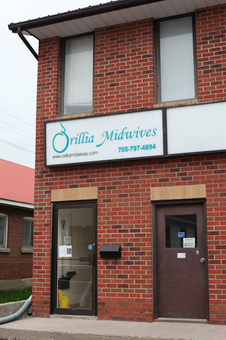 Where Orillia Midwives practice: Our goal is to provide midwifery care to Orillia and the communities surrounding Lake Couchiching. Click here for more detailed information. Complete the form below to email us (info@orilliamidwives.com) or if you want to become a client please click here to complete the appropriate form. We are upstairs from Shoppers Home Health, across the street from Lakehead University's Downtown Orillia Campus, and right next door to Bounty Fish & Chips.